The following video clip shows an early morning preferred area of rising motion over a pond (pond not visible). Airflow converges toward the warmer air above the pond leading to upward motion. Uniform cooling or heating over sloped surfaces can generate cold air drainage and upslope flows, respectively (** link to local surfaces). This sketch indicates a number of possible complications with typical surfaces. 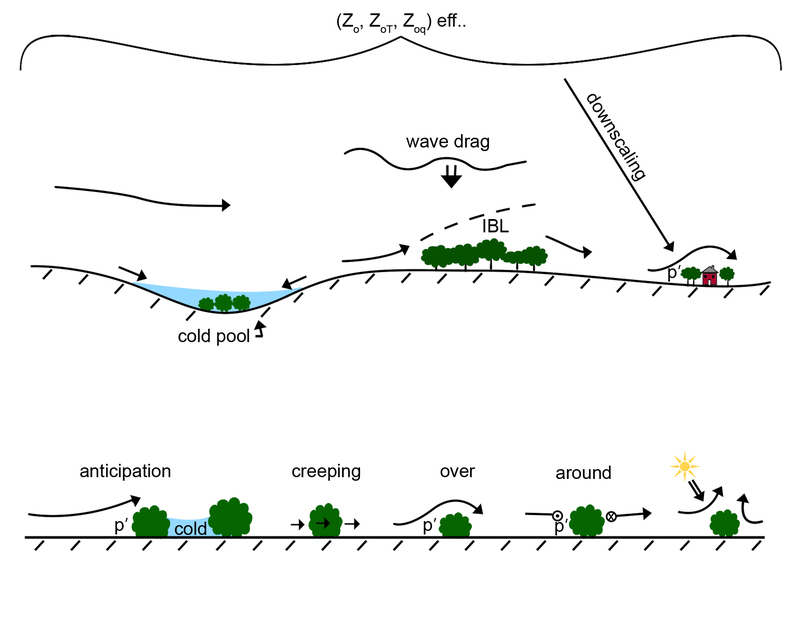 For nocturnal conditions with clear skies and weak large scale flow, cold pools will form in low lying areas (upper sketch). Small cold pools may be embedded within larger cold pools. Patches of trees or rougher surfaces, in general, may induce an internal boundary layer where the flow within the internal boundary layer is influenced primarily by the local surface. Flow above the internal boundary layer is influences primarily by the upwind boundary layer (**link to sketch). Isolated buildings are too local to generate an internal boundary layer but disturb the flow through an induced perturbation pressure field. Waves in the stable nocturnal boundary layer can lead to instabilities and turbulent mixing. With computer models, the entire region may be represented by one grid box and represented in the model by effective parameters such as an effective roughness. Downscaling refers to approaches that transform the prediction of atmospheric conditions for a given grid box(horizontal area) down to atmospheric conditions at a point. The bottom of this sketch focuses on smaller scale variations choosing an individual bush as an example. If the bush is sufficiently dense, flow approaching the bush may lift over the top through a local pressure perturbation. If the air between the bushes is colder, as might occur on a clear night, the overriding air does not mix down to the surface. If the air is moving very slowly, the perturbation pressure is too weak to deflect the air and it “creeps” through the bush. If the air is strongly stratified as on a clear night with weak winds, the airflow can no longer lift over the bush and flows around it. In the daytime with clear skies and very weak winds, individual bushes can induce upward convective plumes, particularly if the evapotranspiration is not too large. Flow of natural fog over an obstacle.